Although it's (kind of) inside the game already. In case you missed it—maybe because you were staring directly at the Trump, and not at fiery gas giants located in outer space—NASA has discovered seven new planets we humans could potentially live on, just as soon as we figure out how to travel 40 light years to another solar system. Upon its discovery, that solar system was named TRAPPIST-1 (presumably, TRAPPIST and TRAPPIST_Official were already taken), and I'm talking about it now because Elite: Dangerous is set to add it in an upcoming patch. Well, there's a little more to it than that, as explained by Frontier Development's David Braben over on the Frontier forums. It seems there's already a TRAPPIST-ish system present in the Elite: Dangerous universe, and in "very nearly the same place" to boot. 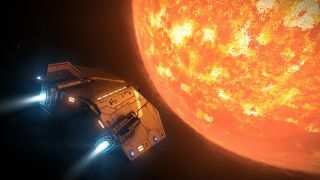 It's a bit of a stretch to say that Stellar Forge, Frontier's universe generation system, predicted TRAPPIST-1, but Braben says it was "only a small tweak" to incorporate NASA's latest data, and update the Elite: Dangerous universe to reflect the latest discoveries. TRAPPIST-1 will appear in update 2.3 (AKA 'The Commanders'), which will be available in beta form from tomorrow. This first beta phase won't contain the new solar system, however the second phase will, and it will obviously be present when update 2.3 launches for real further down the line.